On the days my daughter is in school, I've decided to try crafting with my toddler. His skill level is different from his sister's, and he gets frustrated when he's not able to make his pictures look like hers. This week we worked on our first project, a sticker page inspired by a spring themed counting book. 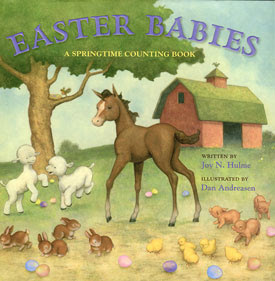 Everything looks fresh and new in this springtime counting book full of cheerful, sweet baby animals on the farm. From a baby foal to kittens, bunnies and ducklings -- all the animals along with a few children take the time to enjoy spring. There's even an Easter egg hunt! Unusual for a toddler book, the author uses lesser known terms for some of the animals like kids, nestlings, and hens in her rhyming verses. The brightly colored illustrations by Dan Andreasen show the beautiful scenery in a rural area and on a few pages the city and churches are shown in the distance. Children can count along all the way up to the number twelve, as everyone celebrates a joyous Easter morning and new life. "In churches all around the town 12 Easter bells are ringing ... "
I'm always pleased by the quality of Sterling children's picture books. They use high quality materials, and it is evident that much thought and planning goes into each and every one of their books. I was pleasantly surprised that Easter Babies has an ever so slight religious tone, with the church bells ringing at the end. 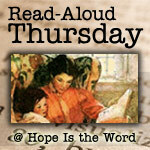 This is a perfect title to share with your favorite toddler or preschooler during the Easter holiday. For our stART (story + art) project this week, we made a Barnyard Sticker Page Craft, using the same animals found in the Easter Babies book. 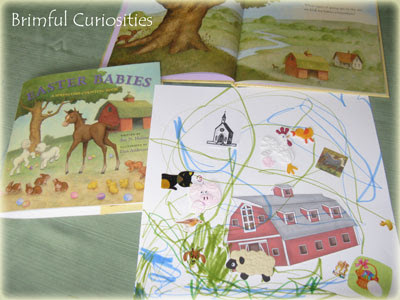 As we read the book together, my toddler identified then placed each animal on the page, starting with the foal. 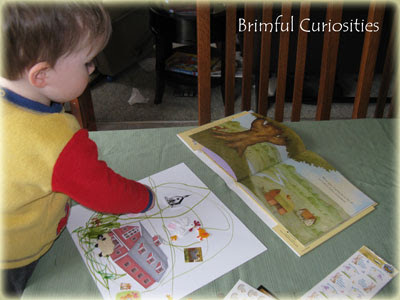 When he was finished placing the stickers, we counted the animals on his page, and he drew in grass and clouds. Oh, I love this, especially since I'll have my own toddler again in a couple of years! Fun! What a good idea to let him have his own, one on one, crafting time. 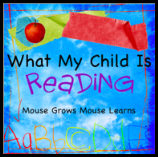 What could be better for toddlers than stickers? I admit that they are still my "cop-out" tool for quick projects. The book sounds lovely too. What a great sticker page - it looks great! The artwork from the book looks really familiar. I'm going to have to look up that illustrator. I am going to have to look for this book I think Emily would really enjoy it. I love the sticker project, we did something similar awhile back and Emily LOVED it. I actually had a farm sticker book that I got at A.C. Moore for $1. Take care and thanks for the great content as always.